Early this afternoon, Brett hollered at me from somewhere down the hall. It went something like this, “Mom, come here for a sec.” I said, okay, and responded with exactly the same level of obedience as my children do when I call them. A few minutes later Brett clarified. “…and by ‘for a sec’ I mean right now.” His voice had gone up an octave or so. This got my attention at least as much as the words did. “Where are you?” I called as I walked down the hall. I spent the next 30 minutes going through every item of clothing, every purse, every box, from high to low. Bats usually like to go as high as they can, so I was puzzled when I couldn’t find anything. They are quite proficient at hiding, however, so I gave up, put everything back and figured it would come out tonight at dusk. About an hour later, I was looking at the closet again and trying to think like a bat. We have those crazy folding doors on our closet, so I was looking between them trying to see if it was hanging inside there when a pair of pointed ears caught my attention. 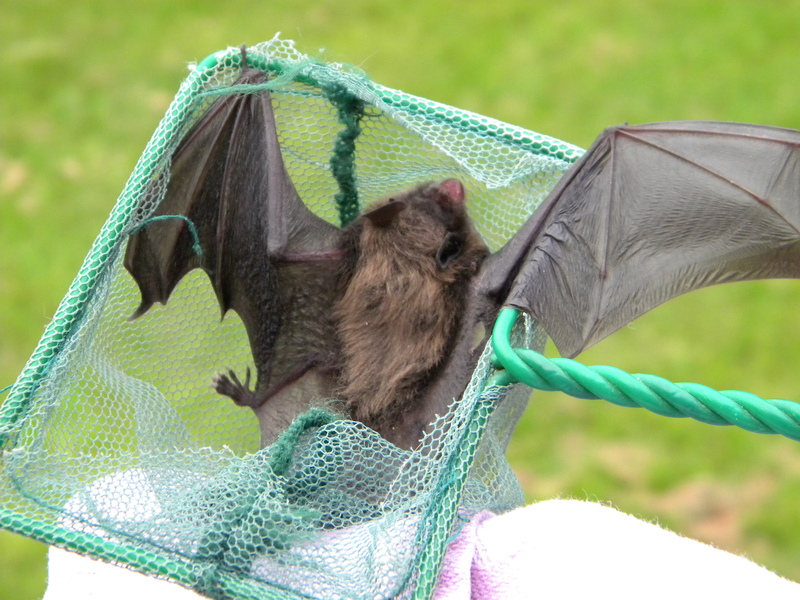 I grabbed a chair, and my trusty aquarium net, and got down to business, because as much as I admire bats, my bedroom is not a good place for them. 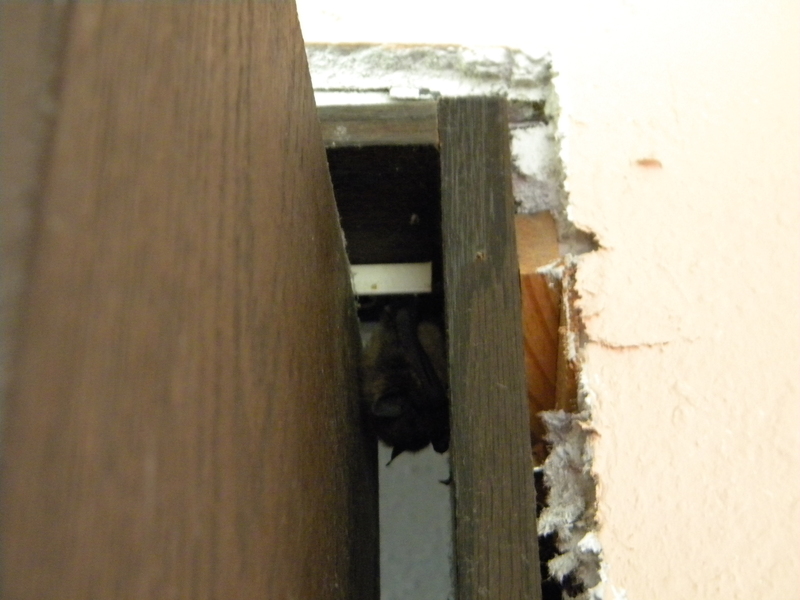 Although I have to admit that if it weren’t for the bat guano, I would probably consider a house bat to combat the many mosquitoes that sneak into my house. Brett overcame his fear, after seeing the little thing hanging up there like an upside-down mouse, and stood by to watch while I coaxed it into my net. Once I had it netted (with a kitchen towel behind the net), Brett came closer to get a good look. He ended up taking the net from me and holding it while I took a couple of pictures. Amazing, isn’t it? Notice its little mouth open, trying to scare us away. It clicked at me when I first caught it (probably trying to figure out how to get around me), but settled down when I began to walk around the house and just went along for the ride. We took it outside and tried to let it fly off by itself, but it landed on the ground and we were afraid one of the dogs or cats would get it, so Brett picked it back up in the net and took it to one of the trees. 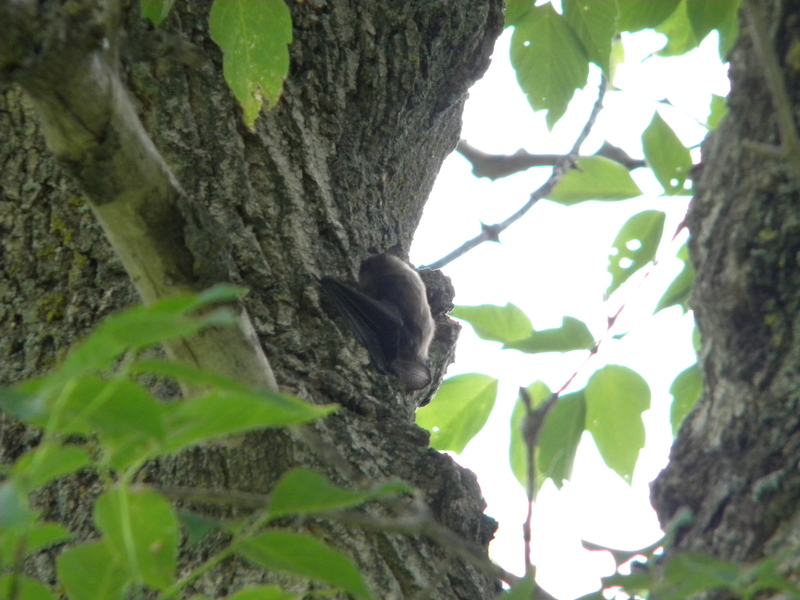 It climbed up to one of the higher branches and rested for a few minutes before climbing higher and out of sight. Hopefully, now that it’s dark outside, our little temporary house guest is out catching some dinner.